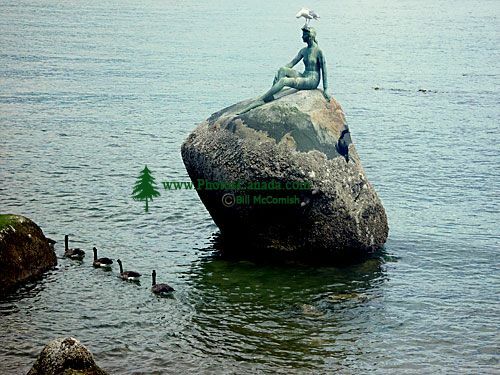 Description : “The Girl in the Wetsuit”: Copenhagen has its Little Mermaid; Vancouver has the Girl in the Wetsuit. The figure was unveiled in 1972.Everybody calls her the mermaid, but her real name is Girl in Wetsuit. When the tide comes in, she will be sitting with her feet in water. The seawall is a favourite destination for walkers, runners, bicyclists, and roller-bladers. The section around the park is one-way for cyclists and roller-bladers, running counter-clockwise. All images on this website are legally protected from unauthorized use by international copyright law. or used as the basis for other photographs or illustrations.